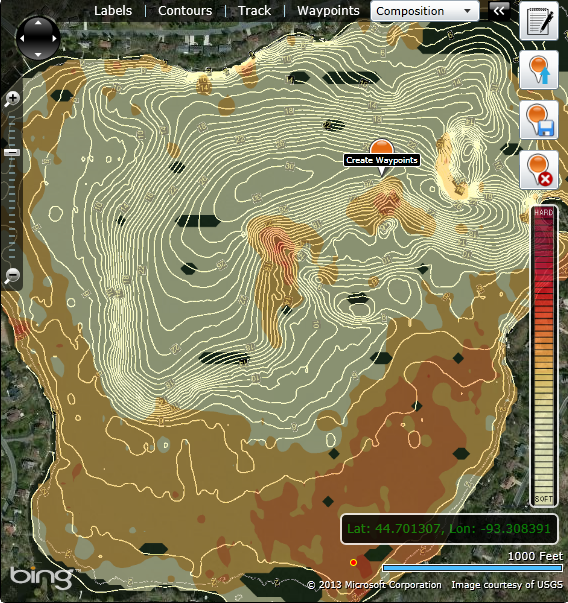 Bathymetry is the process whereby the surface of a pond is plotted using GPS technology, and each of the GPS points recorded is linked to the corresponding depth of the pond at that specific point. After collecting surface location data with their associated depths, a three dimensional model of the bottom of the lake can be developed. With this information, the existing volume of water of the pond can be quantified. This volume (storage capacity) can then be compared to original design plans to determine how much of the original storage capacity has been displaced by the accumulation of sediment and organic matter at the bottom of the pond.